Race to Robie Creek is Saturday, April 20, and thousands will be jockeying for position. 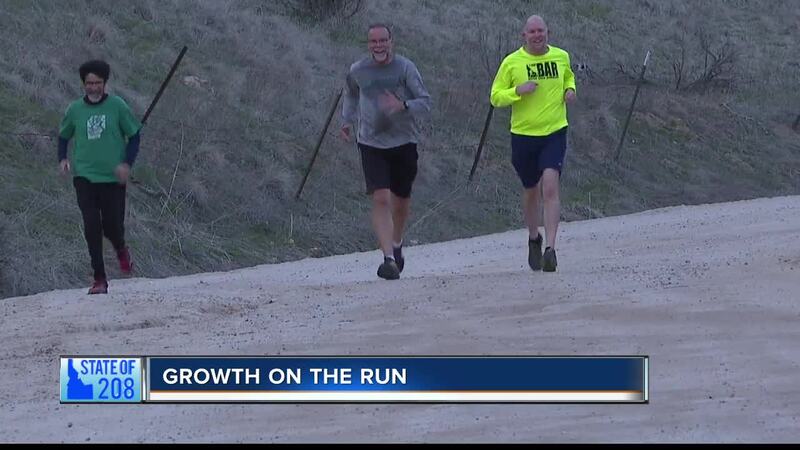 It's no coincidence the running scene in the Treasure Valley has exploded right along with our growth. Vicki Stieha with the Boise Area Runners says her group is one of many clubs to chose from and she has seen first hand what our growth has done to her club. "I was looking at our membership--it seems we have seen almost a 40 percent increase in membership and a lot of the new member have out of town addresses," Stieha says. We caught up with a number of B.A.R. members training for Robie Creek on Rocky Canyon road. Robie Creek has always been a tough race to run, but getting a bib even harder. Stieha says it's even more important to be quick on sign up day. "Robie sold out fast. I know a lot of friends who couldn't get their numbers," Stieha says. It seems there other races that are getting a lot more people signing up, like the Y-M-C-A and St.Patrick's Day runs, but as Stieha is quick to point out, the more the merrier. "No matter what distance, we have ultras, and 5ks, run with the dogs, for the Woman's Alliance, all kinds of causes and sizes," Stieha says. By the way, if you're one of the lucky ones to run Robie Creek on Saturday, good luck.